A quick 3 day trip with the Family to Disneyland Paris, a couple of weeks on the Costa del Sol, a skiing holiday or a shopping trip to New York, when it comes to travel the options are endless. Our Family travel insurance policies have therefore been designed with flexibility in mind so that no matter what the destination, duration or activity, you will always have a choice of cover to protect your interests and those of your family members. So when it comes to choosing a Family policy and comparing our cover against others there a couple of things to note. 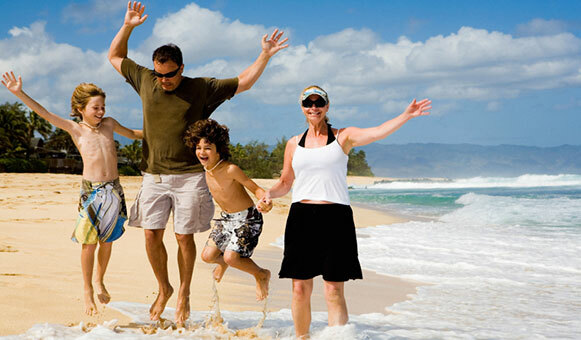 All our Family travel insurance policies will cover the children for Free. In addition, we cover on selected policies children up to the age of 21 provided they are in full-time education, so children at University and College are covered for free! These policies also cover all family members to travel independently which is key if your children travel with the school or with other people or are going off by themselves. So when it comes to a search on our site for a Family travel insurance policy, our approach has always been to offer the traveller a choice when it comes to travel insurance. Following a simple quote stage where we determine your needs, the policy options are laid out on screen in such a way that you can easily see what is covered and more importantly whats not covered under each policy. Comprehensive single trip and annual multi-trip travel insurance for Families covers the policyholder for insurable events that may occur before or during travel, such as trip cancellation/interruption, medical expenses for injury or illness, theft of valuables, baggage damage and more. The cost of travel insurance is based on the type of cover requested, the age of the insured, the destination of travel the length of stay, type of activities covered and whether you have any pre-existing medical conditions. We have a wide range of available travel insurance policies available to suit all needs. (1) All Clear Travel, Wanderlust.